Batch 'C' 2014 begins November 4 - Corpr! The National Youth Service Corps (NYSC) has said that the 2014 Batch `C’ orientation will hold from Novenber 4 to November 25. This is contained in a statement issued by the NYSC Director, Press and Public Relation, Mrs Abosede Aderibigbe, in Abuja, on Tuesday. The statement advised prospective corps members, parents, guardians and the general public to take note of the date, saying the exercise was not cancelled. It said the information was necessary because of speculations that the batch `C’ exercise had been cancelled. “All our scheduled orientation courses remain as planned; and if it becomes necessary to make any changes, such will be communicated to all stakeholders through the appropriate channels. It stated that information could also be obtained through the NYSC website- www.nysc.gov.ng . 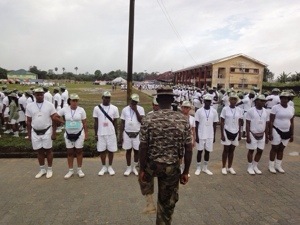 The scheme also said that all prospective corps members could register online and also print their call-up letters online starting with the 2014 batch ‘C’ orientation. “There will be no need for them to travel to their respective schools to collect call-up letters before reporting at the orientation camp. “Operational details of this will be made known soon,’’ the statement explained. Wishn al propective corps membr of batch b congrtn, lord av mercy on me let my time comes, can’t wait seeing myself serving my father’s land of honor. Wishn al prospective corps membr of batch b congrtn, lord av mercy on me let my time comes, can’t wait seeing myself serving my father’s land of honor.